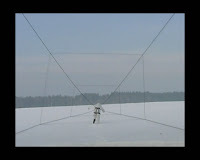 I went to a screening at Tate Modern last night of work by Polish artists Anna Molska. I saw a few of her pieces a couple of years ago at the Berlin Bienale and was immediately attracted by the combination of moving image and abstract form. Listening the the discussion after the screening I am starting to see this work a little more in context and, what I think is interesting from my perspective is an extension of this relation between form and movement. There seems to be a consideration of idealised forms - whether from modernist art (especially constructivism), renaissance (in the form of the perspective lines created in early performance video), or Chinese in Tanagram, 2006/2007. These are inherited fine art forms muddled by Molska by the introduction of real-life people interacting with them. The impossibility of these forms which seems inextricably linked to Poland's Communist past perhaps point also to the contradiction inherent in the realisation of utopian ideas. A utopia (an elsewhere, or impossible, imaginary place) can exist in the realm of ideas and forms. It can be ideological and aesthetic. But when it becomes a reality it's functionality comes into question. Then comes a question of struggle, which is present in a couple of Molska's pieces, notably the artists physical struggle with her perspective lines (literally lines of bungy cable) as she stretches them away from the camera), or the struggle of the workers in The Weavers now unemployed who speak of their terrible living conditions. Here idealised aesthetic forms give way to the idealised architecture of the pit head, a symbol of the communist worker and his utopian labour, no longer revered, and the physical struugle of labour in an outdated industrial setting. In some ways these films stage the the utopian dilemma. That of the utopian theory, form or image confronted with the less than utopian people.